There's something satisfying about taking/recycling pieces of cardboard and fastening them together to make interesting new creations. To that end, check out the video above of the automated cardboard horse that gallops around Bulgaria. Using cardboard, and what appear to be "zip ties" the artist has made not only a cool kinetic piece, but has also created something that gives community members an excuse to gather together --- big fun! If you're not ready to create your own animated cardboard beast just yet, you might be interested in checking out MAKEDO, a reusable building system from Australia, that enables materials including cardboard, plastic and fabric to easily join together to form new objects or structures. 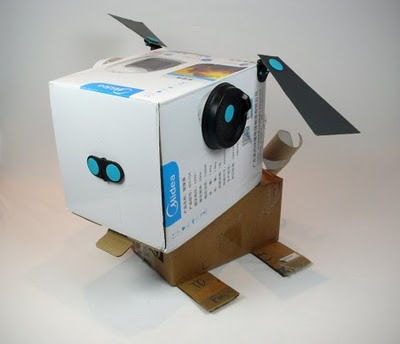 MAKEDO looks like a great "maker" activity for museum programs or "crafty" exhibit areas. So, look around for project scraps, or ask your your local appliance store for some old cardboard cartons, and get building! We made robots with the Makedo system at the first MuseumNext workshop and it was great - very easy to use. But I also recall it was pretty expensive. They'd be perfect in a facilitated program where the parts can't walk away by the bucketful. So sweet--horse riding two bicycles. And the music is lovely. Thanks, Paul!